This comprehensive Human Physiology question bank was created by Dr. Larry R. Engelking, Professor of Biomedical Sciences, Emeritus, from Tufts University, with the assistance of Dr. Irwin M. Arias, Dr. James F. Dice, and Dr. Kathleen Dunlap from the Department of Physiology. Dr. Engelking has been teaching physiology to medical and veterinary students for over 20 years, and has authored four textbooks and many research articles. 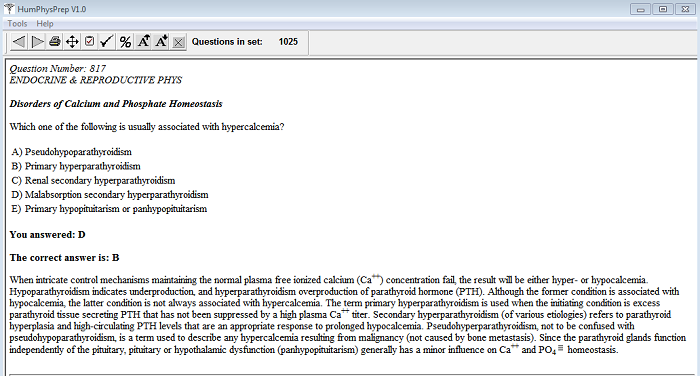 He designed this question bank for medical, dental, pharmacy, nursing, and allied health students who wish to organize and test their thinking in physiology while preparing for their national board exams, for interns and residents preparing for their specialty board exams, for graduate students in physiology, biochemistry, pharmacology, bioengineering, and nutrition, and for practicing physicians, dentists, pharmacists, nurses, and allied health practitioners who wish to update their general knowledge of organ systems physiology. This question bank is not intended to replace the excellent detailed manuscripts and textbooks of physiology available, many of which were consulted during its preparation, but it is intended to examine comprehension of the basic principles of organ systems physiology. Indeed, flow diagrams and figures were intentionally omitted in order to encourage users to consult their textbooks and other resources when more detailed explanations are required. An Individual License authorizes only one individual to use the program. The authorized user may install the program on more than one device, however, the CD must be in the CD drive in order for the program to run. This version of the CD does not time out. Multi User Licenses: We offer Site, Corporate and other Special Licenses. A Site License allows unlimited usage by employees/students at a single location. A Corporate License allows unlimited usage by employees/students throughout an entire organization. Call us at 1-800-377-9717 for more information about Corporate or other Special Licenses. The online, downloadable and CD version of the HumPhys program is scheduled for release this winter. The program will work on devices with a CD drive and running Windows Vista, 7, 8, 8.1 or 10 and 20 MB of disk space. The CD must be in the CD drive for the program to run.